The technology likely to have the greatest impact on the financial services industry and the world of business has arrived. Not peer-to-peer lending, artificial intelligence, big data, robo-advisors or Apple Pay -- I'm talking about the blockchain, the technology behind digital currencies such as bitcoin. Blockchain represents nothing less than the second generation of the Internet, and it holds the potential to profoundly transform the financial services industry. Because the first generation of the Internet was built for moving and storing information, not value, it has done little to change how we do business or access financial services. When you send someone information, you're really sending a copy, not the original. It's okay to have a printing press for information -- but not for money. As a result, we rely on powerful intermediaries, such as banks, to establish trust. Today's financial intermediaries also perform eight important functions in business and society: authenticating identity and reputation, moving value, storing value, lending and borrowing, exchanging value, funding and investing, insurance and risk management, and audit and tax. We call these the "golden eight," and they will all be transformed through blockchain. Over all, these intermediaries do an okay job, but with limitations. They use centralized servers, which can be hacked. They take fees. They capture our data. They run on outmoded technology. Regulations are antiquated. These intermediaries also exclude two billion unbanked people who can't prove identity or don't have enough money to justify a bank account. In sum, intermediaries capture a lopsided share of the benefits of the digital economy, just as they did in the pre-digital economy. Enter blockchain, a vast, global and distributed ledger running on millions of devices and open to anyone, where not just information but anything of value -- money, equities, bonds and other financial assets, titles, deeds, music, art, scientific discoveries, intellectual property, even votes -- can be moved and stored securely and privately, and where trust is established not by powerful intermediaries but through mass collaboration and clever code. If the Internet was the first native digital format for information, then blockchain is the first native digital format for value -- a new medium for money. It acts as ledger of accounts, database, notary, sentry and clearing house, all by consensus. And it holds the potential to make financial markets radically more efficient, secure, inclusive and transparent. Blockchain entrepreneurs and incumbents alike are working to devise new ways to perform the eight core functions of financial intermediaries through blockchain technology. Today, we rely on rating agencies, analytics firms and banks to establish trust, verify identity in transactions and decide who merits access to the system. In contrast, reputation accrues on the blockchain itself. Blockchain technology lowers or eliminates the need for trust altogether. Blockchain startups such as Circle, Abra and Paycase want to make retail banking a global free commodity, like Google, and can do so because their back end, supported by blockchain, is secure and inexpensive to run. "When was the last time you sent a 'cross-border e-mail'?" asked Jeremy Allaire, CEO of Circle, rhetorically. He bets hundreds of millions of millennials globally will find this prospect appealing. Retail, commercial and mercantile banks, along with credit scoring and rating firms, facilitate the issuance of credit card debt, mortgages, corporate and municipal bonds, T-bills and asset-backed securities. On the blockchain, anyone could check creditworthiness before issuing, trading and settling traditional debt instruments directly, reducing friction and increasing transparency. The unbanked and entrepreneurs everywhere could access loans from peers. Market-making will change profoundly as financial assets move from a paper-based format to a native digital format based on blockchain. Settlement times on transactions can be reduced from days or weeks to minutes or seconds. This is a huge opportunity for incumbents to reduce cost, but it also poses risks. The halcyon days of entrepreneurship may be upon us. Ethereum, a blockchain platform supported by Microsoft, Manulife, Deloitte and others, got its start as a "blockchain IPO" -- issuing native tokens for bitcoins. No need for bankers, lawyers, auditors and stock exchanges. Today, it's worth $1-billion (U.S.). Blockchain also automates the matchmaking, enabling more efficient, transparent, secure models for peer-to-peer financing, recording dividends and paying coupons. Using reputation systems based on a person's economic and social capital, insurers will be able to make better-informed decisions, which explains why Manulife just announced a flagship agreement with blockchain developer Consensus Systems. The over-the-counter derivatives market, with a notional value of $600-trillion, is paper-based and opaque and relies too heavily on centralized clearinghouses. Moving all derivatives to blockchain would reduce counterparty and systemic risk in the financial system. Traditional accounting practices are not keeping pace with the velocity and complexity of modern finance. The blockchain's distributed ledger will make auditing transparent through time-stamped third entries on a blockchain, enabling regulators to more easily scrutinize financial actions within a corporation in real time. Deloitte, PWC and others are investigating these "triple-entry" accounting schemes for their audit practices. Given the promise and peril, Wall Street has woken up in a big way. More than 45 leading banks, including Royal Bank of Canada , have joined the R3CEV Consortium to develop blockchain infrastructure for banking. IBM launched the Hyperledger project, which counts Deutsche Bank, the London Stock Exchange Group and Wells Fargo as members. Microsoft is in the game, as are Visa, Cisco, Intel and many other leading tech companies. Venture capitalists are piling in, too. In 2014 and 2015 alone, more than $1-billion of venture capital flooded into the emerging ecosystem, and the rate of investment is doubling annually. "We're quite confident," said Marc Andreessen, an Internet icon and venture capitalist, "that when we're sitting here in 20 years, we'll be talking about blockchain the way we talk about the Internet today." Governments believe blockchain could simplify and improve the delivery of services and empower regulators and central bankers to do their jobs more effectively. So is this the death knell for financial services or a new platform for reinvention? For sure, blockchain will create winners and losers. Banks can thrive if they can steer clear of the innovator's dilemma and disrupt from within. Leaders of the old rarely embrace the new, but we remain hopeful. The greatest opportunity for Canada is to use blockchain to kick-start our innovation economy by embracing the entrepreneurs who are instigating change. Canadian entrepreneurs have been on the leading edge of blockchain innovation from the beginning. Ethereum, mentioned earlier, was founded by a group of Canadian developers, led by Vitalik Buterin. It recently became the first crowd-funded blockchain "unicorn." Consensus Systems, run by Canadian CEO Joseph Lubin, is a blockchain juggernaut, building applications to reinvent a dozen industries. And a growing constellation of entrepreneurs and technologists are trying to build the future at companies such as Ledger Labs, Paycase, Unocoin and Blockstream. Can we nurture an environment where entrepreneurs and their ideas can flourish? There is a critical mass of talent in Canada right now. What's needed is bold, multi-stakeholder leadership. The unstoppable force of blockchain technology is barreling down on the immovable infrastructure of modern finance. We would like this collision to transform the old money machine into a prosperity platform for all. 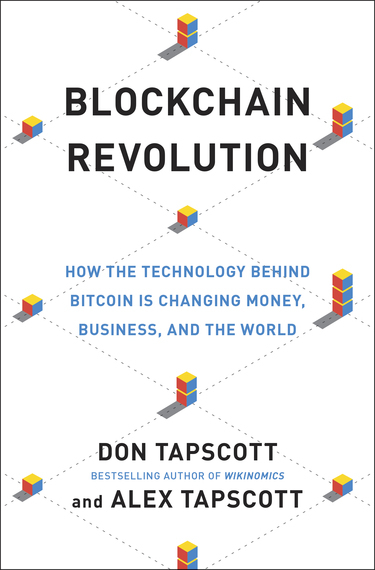 This post is adapted from Don & Alex Tapscott's new book, BLOCKCHAIN REVOLUTION: How the Technology Behind Bitcoin is Changing Money, Business, and the World and originally appeared on TheGlobeandMail.com.